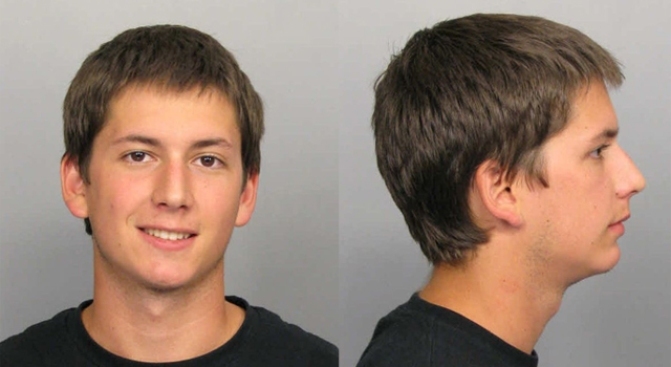 Shown here in his booking photo, Tyler Weinman, 18, was charged with 19 counts of animal cruelty, 19 counts of improperly disposing of an animal body and four counts of burglary. A teenager recently arrested on marijuana charges is accused of torturing, mutilating and killing almost 20 cats in South Miami-Dade in less than two months. Tyler Weinman, 18, was charged with 19 counts of animal cruelty, 19 counts of improperly disposing of an animal body and four counts of burglary. A Miami-Dade judge set bond at $249,500 for the trouble youth and required that a psychiatric evaluation must be done before the teen is released on bail. Weinman would also be fitted with an electronic monitor. Police say more suspects might be forthcoming in the case where at least 33 cats were found murdered. Police said they had him under surveillance for the last two weeks - a period in which several cats were killed. His neighbors said that police interviewed him weeks before on the night of his high school prom when they whisked him away in a tuxedo and he was forced to miss the dance. He was eventually arrested just after midnight Sunday morning at a house party at in Coral Gables after Circuit Judge Darryl Trawick signed an arrest warrant. He smiled for his mugshot. Although Weinman stated he attended Miami Palmetto High School on his Myspace page, sources said he was expelled a while ago, possibly for possession of marijuana. Also, Miami Palmetto High School held its prom on April 18th - three weeks before the first reported cat killing - according to a PTSA Palmetto High School directory. Weinman was also arrested on May 29th for marijuana possession, according to court records. It is not clear if this arrest led to the animal cruelty charges. Details remain sketchy because the judge ordered the arrest warrant and affidavit sealed, which would reveal the evidence against him. Weinman appeared like a well-adjust teen who liked to goof off, according to his Myspace page. He apparently had a long-term girlfriend. He was also one of 1,449 members of the Facebook page Catch the Cat Killer! One guy even started a Fans of the Miami Cat Serial Killer Facebook page. So far, there are two members. Weinman lives with his mother, Alba Weinman, in Cutler Bay, where four of the killings occurred. He also spent time with his father, Douglas Weinman, who lived less than two miles away. The bulk of the cat killings occurred in this radius. Miami-Dade State Attorney Katherine Fernandez-Rundle said the investigation will continue. "I commend the police officers of the Miami-Dade Police Department and Senior Trial Counsel Michael Von Zamft who worked tirelessly and exhaustively with our law enforcement partners in order to put an end to these acts of cruelty," she said in a press release. "My heart goes out to the pet owners who have suffered such a great loss."